London property prices have continued to fall in the last year while growth in England remains lower than other countries in Britain, according to official figures. There has been a slowdown in house price growth in the past two years, thanks mainly to a slump in sales in the South and East of England, data from the latest Office of National Statistics’ index shows. This has meant housing value growth in England has been slower than in other UK countries with Brexit also blamed for subdued property activity. As discussions continue, uncertainty in the property market remains and some transactions may have been postponed until the European Union withdrawal takes place. However, despite the slowdown, the average price of a home in the UK increased by 2.8 per cent in the year to November 2018 – up slightly from 2.7 per cent in October 2018. This is compared with a decrease of 0.3 per cent in average prices during the same period a year earlier. The ONS figures lag a month behind other indexes. London saw the lowest annual growth, as prices dropped by 0.7 per cent over the year to November 2018. The Bank of England’s November inflation report highlights the slump in the London market since mid-2016 is likely due to the area being disproportionately affected by tax and regulatory changes, as well as by lower net migration from the EU. While London house prices have fallen each month since July 2018, dropping 1.2 per cent since October 2018 to November 2018, it still remains the most expensive area to purchase a house, at an average price of £473,000. The next most expensive region is the South East with an average cost of £324,000, followed by the East of England at £295,000. In comparison, the North East still has the lowest average price property at £132,000 – the only English region that is yet to surpass its pre-economic downturn peak. The average price of a property in Britain in November 2018 was £230,630 – up £7,000 from November 2017, ONS data revealed. Despite the increase, house prices in England grew slower than the rest of the countries in the UK, increasing by 2.6 per cent in the year to November 2018. This is up from 2.3 per cent from October 2017 to October 2018, with the average house price in England now standing at £247,000. Property prices in Wales saw the biggest increase, rising by 5.5 per cent over the last 12 months to stand at £161,000. Northern Ireland saw a rise of 4.8 per cent over the year to quarter three, July to September 2018. In Scotland, the average house price rose by 2.9 per cent over the year to reach £151,000. 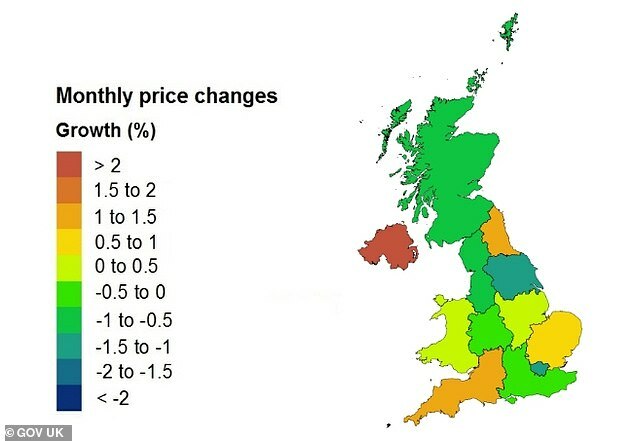 In England, the West Midlands was the region that saw the highest annual growth, as prices increased 4.6 per cent in the year to November 2018. This was closely followed by the East Midlands which saw a rise of 4.4 per cent. Nitesh Patel, Yorkshire Building Society’s strategic economist, said: ‘House prices have risen, but only marginally over the past year, indicating the market is continuing to slow down. ‘This has been driven by a year-on-year 0.7 per cent drop in London property prices, which is the fifth month we have seen this trend. ‘But regions outside London and the South East are still seeing increases, which is why prices are continuing to rise nationally, although slowly. ‘Despite this, the housing market is still being supported by high employment, wage growth and low interest rates. 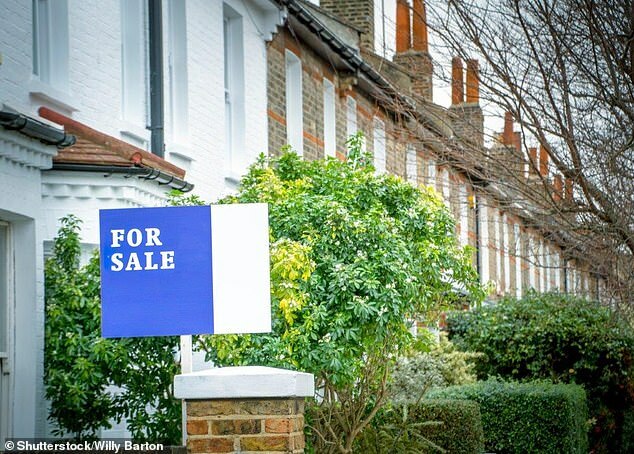 There was also a weaker trend in sales market activity in November 2018, according to the Royal Institution of Chartered Surveyors’ UK Residential Market Survey, which reported the muted activity in most areas was driven by a lack of fresh housing stock and Brexit uncertainty. The number of mortgages approved for house purchases also decreased over the year to November 2018 by 1.7 per cent to 63,700, according to the Bank of England’s Money and Credit report. Richard Snook, senior economist at PwC, said: ‘House prices have now declined for three months, receding from the high of £232,500 in August. ‘If this trend continues, the annual house price inflation rate will soon move into negative territory. ‘The price decline in London continues unabated and shows signs of accelerating. ‘London is one of the most internationally dependent parts of the UK, due to economic integration with Europe and the high share of foreign citizens in the labour market, therefore we predicted in our July 2018 market projections that London house prices would underperform any other region.